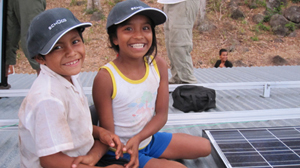 As the only high school student-led solar panel installations in Nicaragua, our Renewable Energies trip will enable you to become an integral part of a project to bring electricity and renewable energy to a remote mountain village. Living with and sharing in the lives of the people that benefit form the project which further enrich your experience as you are fully immersed in the culture and the language and quickly become part of the family. A 22-day journey much like the Health and Nutrition trip we will begin by spending two days at the crater lake of apoyo (locally know as Laguna de Apoyo) where we’ll get to know each other as a group while reveling in the wonder of this natural marvel. From Apoyo we’ll head to the northern part of the country near Jinotega and begin one-on-one language training* with native-speaking instructors while staying on a farm. After our morning classes, we will alternate days between working in nearby communities on sustainable health and nutrition projects and exploring the rich mountainsides and lakes of Jinotega. In the second part of the trip we’ll head to the village which is the site of our solar power project and join the community as family members for the week. We will live in their homes, share their meals and experience the wonders and the challenges of living in such a remote and undeveloped place. Leaving the village we’ll spend a day navigating the Somoto Canyon with our highly-trained and qualified local guides before we head south the the seaside town of San Juan del Sur. In San Juan del Sur we’ll enjoy the warm water and great waves while we learn to surf with some help from our local instructors along the expansive Pacific coast of Playa Hermosa. We’ll also join a local non-profit working in child development and elementary education and lend a hand in the local schools. Making our way back to Managua we’ll stop at the Mombacho Cloud Forest for an exhilarating canopy tour and zipline and then return to where we began the trip at Laguna de Apoyo. We’ll have one more day to soak in the awe and serenity of the place and discuss our experiences of the last three weeks before returning home the following day. Impact:In agrarian communities where rice and beans is the staple of the diet and sometimes its only ingredient, nutrition improves when it is supplemented with fresh, organic vegetables with little added work. Click here to see the results from our greenhouse project.